Did you catch my first article all about Disney’s first-ever Creator Days? 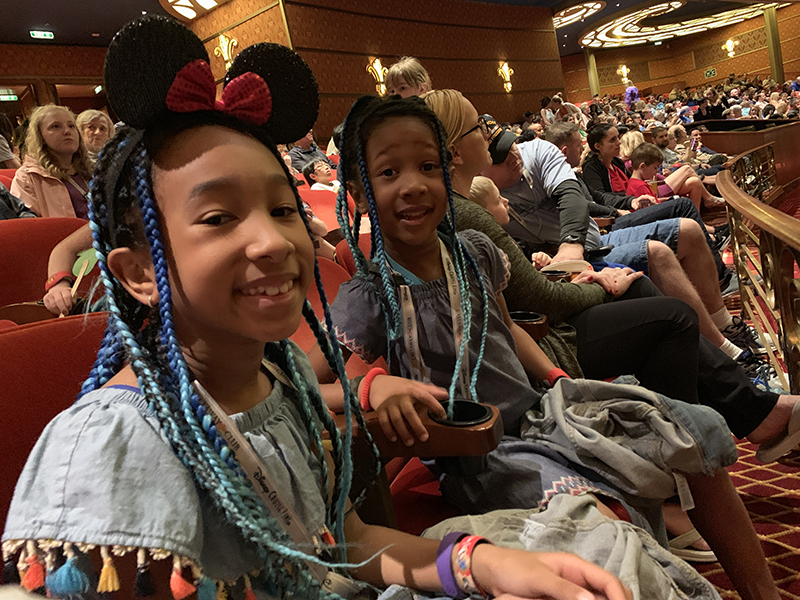 We were thrilled to be invited to attend the hosted weeklong festivities, which allowed us to explore all Disney World has to offer while networking with some of the best influencers in the biz. 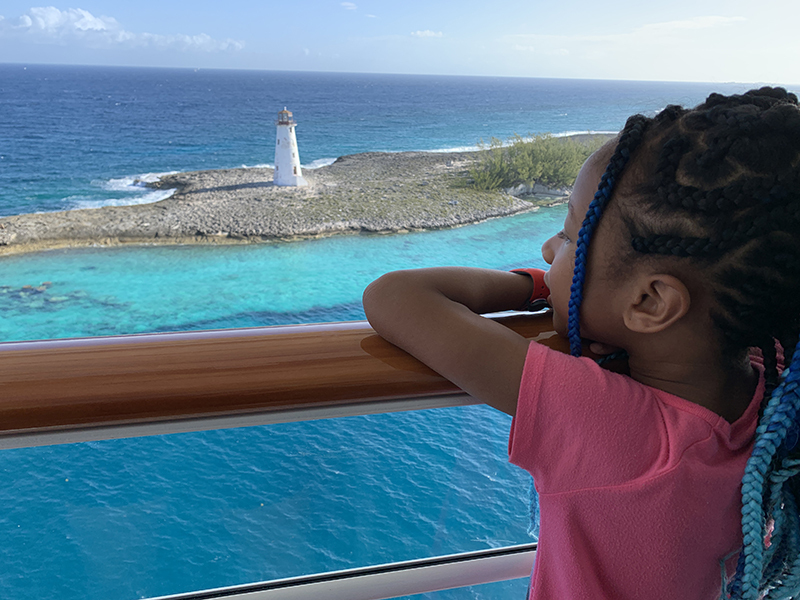 The second half of our vacation included a Disney Cruise aboard the Disney Dream! 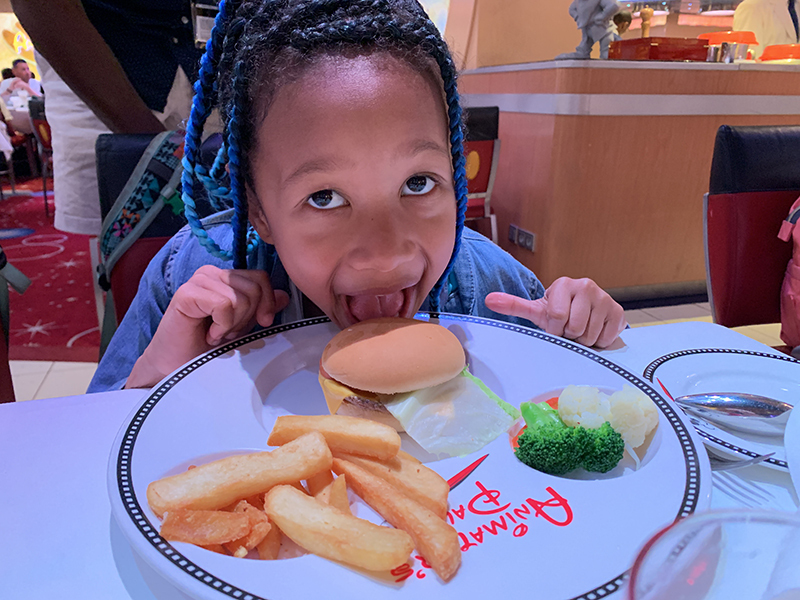 Read on to learn all about our experience and what you can expect when you take the cruise yourself. After a fun-filled few days at Walt Disney World, we headed out to the cruise terminal in Port Canaveral, Florida. When boarding the Disney Dream, Disney Cruise cast members roll out the red carpet treatment: Every family is announced by name, and two rows of cast members clap for you as you make your way across the lobby! Since our stateroom wouldn’t be ready for a couple hours, we decided to head to Animator’s Palate for some lunch. Sean and Ella stuck to the kid’s menu, ordering mac and cheese and a cheese burger, respectively. Serge had a delicious salmon entree, and I had pasta. After lunch, I headed to Evolution, the cocktail lounge, for a welcome reception for influencers. 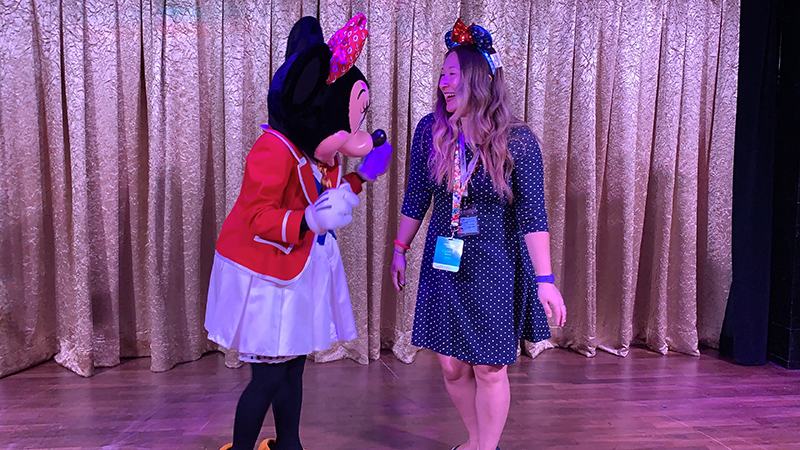 It was fun to meet Minnie Mouse dressed in her cruise director outfit! By the time the reception was finished, our stateroom was ready. 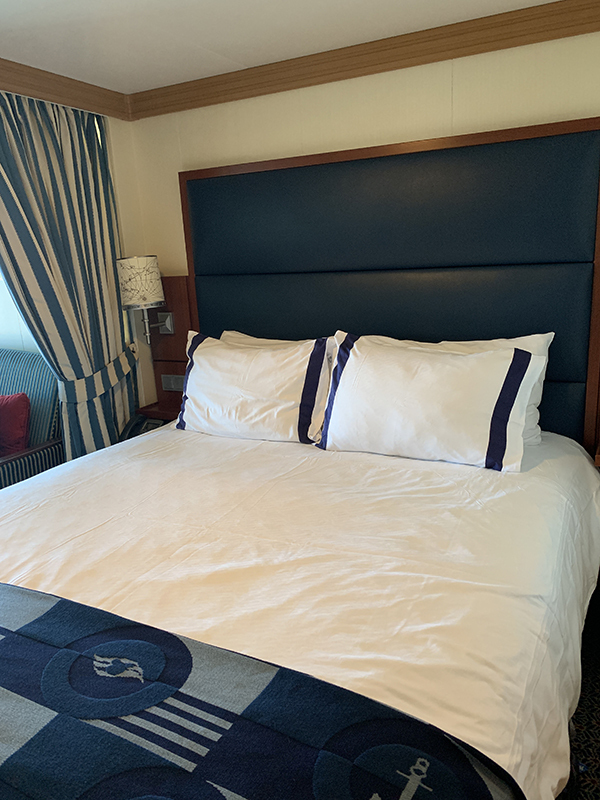 We’ve taken a Disney Cruise once before (on the Disney Magic) and just like that time, we stayed in a Deluxe Oceanview Stateroom with Verandah. The sofa converts to a bunk bed at night, and a curtain provides some privacy between the king bed and the bunk bed. I definitely recommend booking a stateroom with a verandah if you can. It’s great to be able to enjoy the ocean air right from your stateroom. Another tip I’ll share if you haven’t done a cruise before, is to always pack everything you might need for the day in the bags you board with. Very often, your luggage won’t be delivered to your stateroom until the evening, so if you plan on doing any swimming, it’s best to have your swimsuit with you. That evening, our assigned restaurant for dinner was Animator’s Palate (the same place we’d had lunch). One of the coolest aspects of this restaurant is the interactivity of it. There are screens all around the dining room featuring characters from Finding Nemo, and at one point Crush, the surfer dude turtle, began addressing the diners. At first I assumed these were recordings that were being played, but then I realized that he was actually having a back-and-forth conversation with the diners! He could clearly hear their answers and was responding accordingly. I still have no idea how they do this, but it’s just another example of Disney Magic at work! It was great meeting our servers: Vlad from Croatia, and his assistant Vicky from Indonesia. 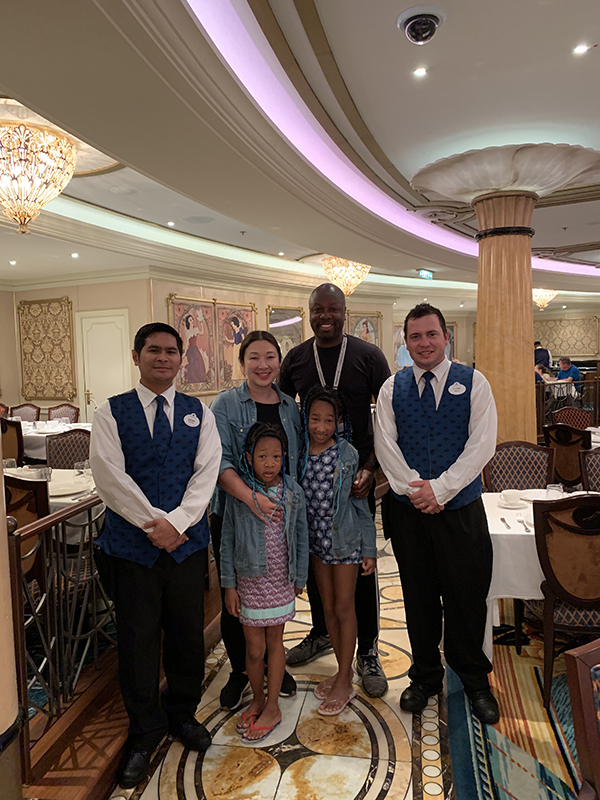 On Disney cruises, the same servers stay with your family every night, rotating from restaurant to restaurant. It’s a great system because they really get to know you and your preferences, and starting on the second night they’ve already got your drink order memorized and bring it without you needing to ask for what you want! After dinner we went to watch The Golden Mickeys, a live Broadway-style show that mimics an Oscars-style show. It was a lot of fun, and featured some of the most popular songs from Disney movies. To be honest I’m not much of a musical theater fan, but even I thoroughly enjoyed all the shows on Disney Dream. 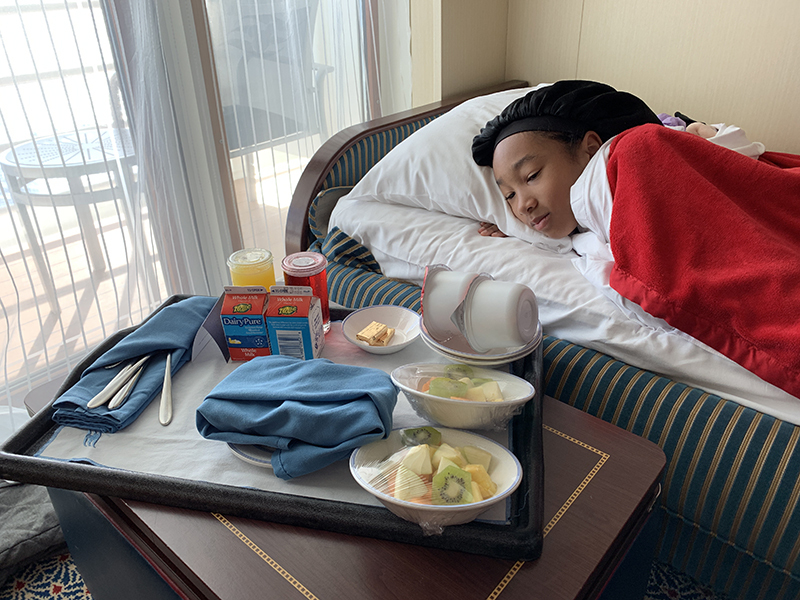 The next morning, we ordered room service breakfast just for the girls, as Serge and I were going to have brunch on our own. 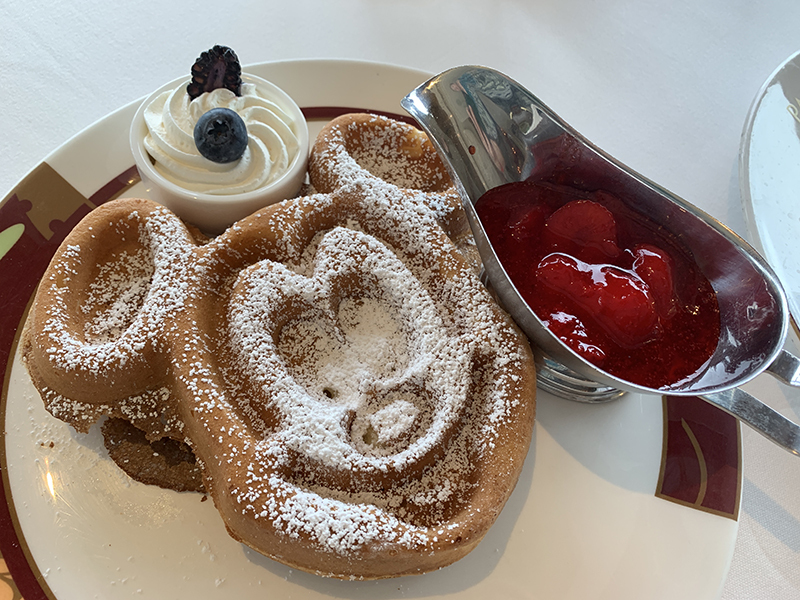 Room service is included at no extra charge on all Disney Cruises, so it’s definitely something you should take advantage of! 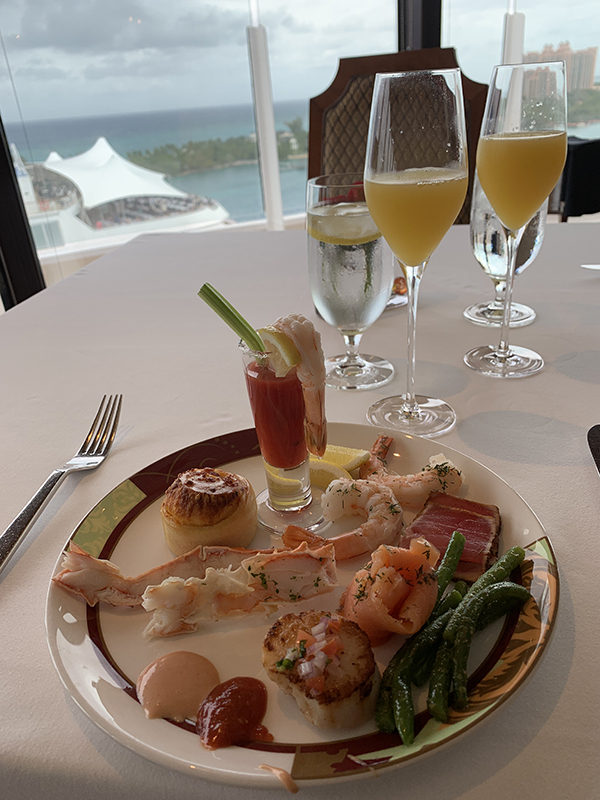 As they were eating, the ship was docking in Nassau, the capital city of the Bahamas. It was fun to watch from our verandah as the shoreline got closer and closer. 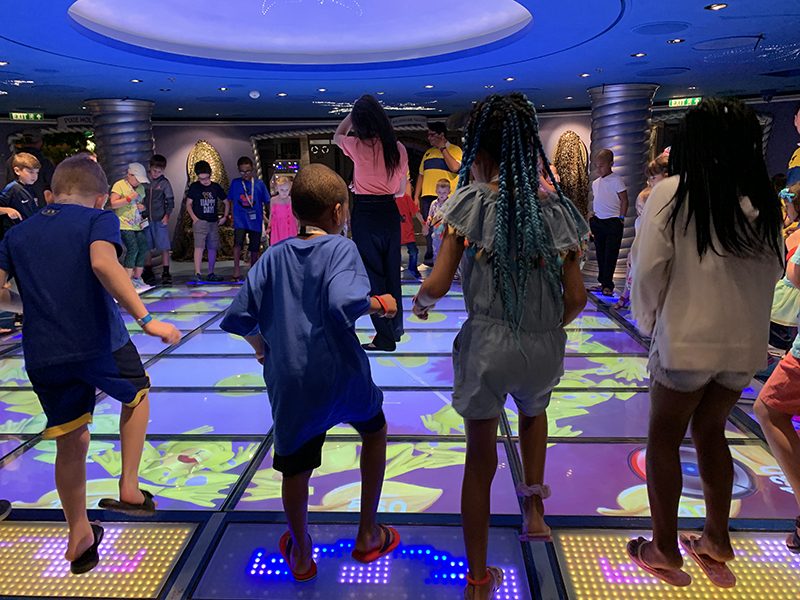 We checked the girls into the kid’s club on the ship, called Disney’s Oceaneer Club, and walked over to Palo. Palo is an elegant, adults-only restaurant with Northern Italian cuisine that’s available on all the Disney Cruise ships. It’s not included in your regular dining plan, so if you plan to eat here, it’s an add-on fee. Also, you should know that it’s a much more formal dining experience than the other restaurants. 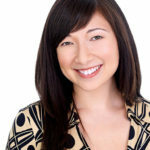 They recommend dress pants, slacks and collared shirts for men; and a dress, skirt or pants and a blouse for women. Jeans are acceptable, as long as there are no holes or distressing in them. Men should also plan on wearing closed-toe, non-sneaker shoes. On our last cruise, the Disney Magic, Serge and I had enjoyed dinner at Palo. We enjoyed that thoroughly, so we were surprised to hear many people tell us that brunch at the restaurant was even better! Turns out, they were absolutely right. 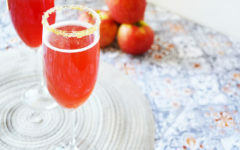 The dinner experience is terrific, but brunch is epic! We were seated at a window-side table, with beautiful views of Nassau, where we had docked. Our server first brought out the menu, from which we selected four dishes. Each dish on the a la carte menu is a bit smaller in portion size than your typical entree, so don’t be afraid to order several items to share. Then, our server brought us to the buffet area. There were four main areas of the buffet. The first table had breads, pastries and fruits. The second table had cold seafood selections like seared tuna, shrimp cocktail and smoked salmon. 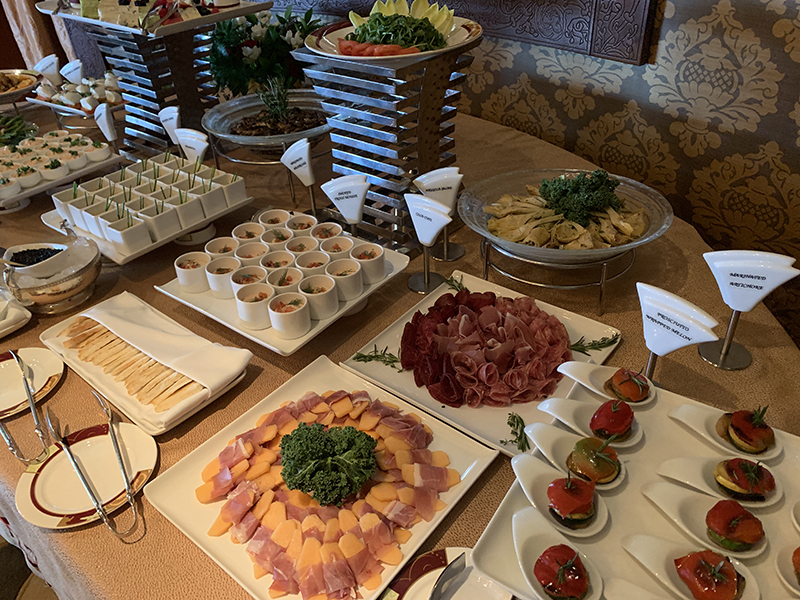 The third table had a selection of antipasti like cured meats, caviar, and salmon mousse. And finally, the fourth table was filled with desserts. Serge and I ordered about five dishes from the a la carte menu, and our favorites were the lasagna Bolognese and the parmesan-crusted chicken breast. Everything was cooked really well and even something as simple as the three-cheese omelet was delicious! 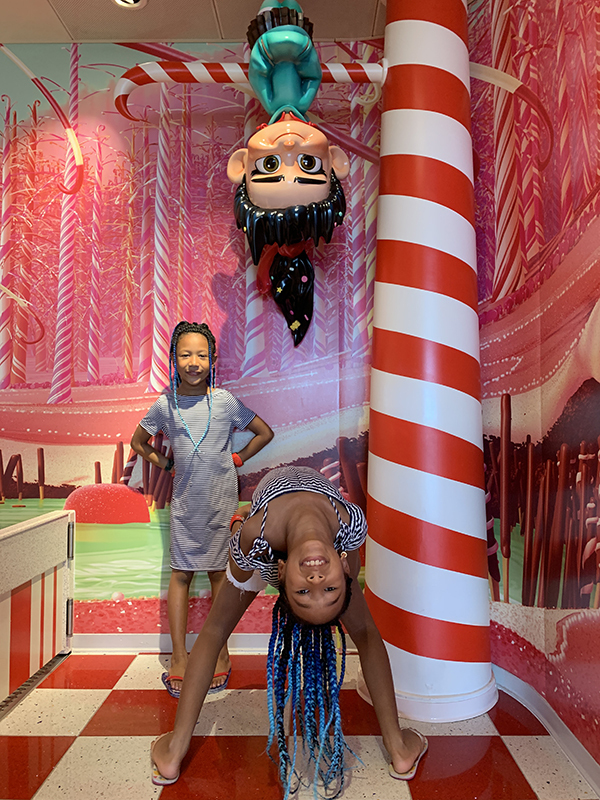 After brunch, we picked the girls up from the Oceaneer Club and made our way to Vanellope’s Sweets & Treats Shop. This ice cream parlor and candy shop features characters from Wreck-It Ralph and is absolutely adorable. 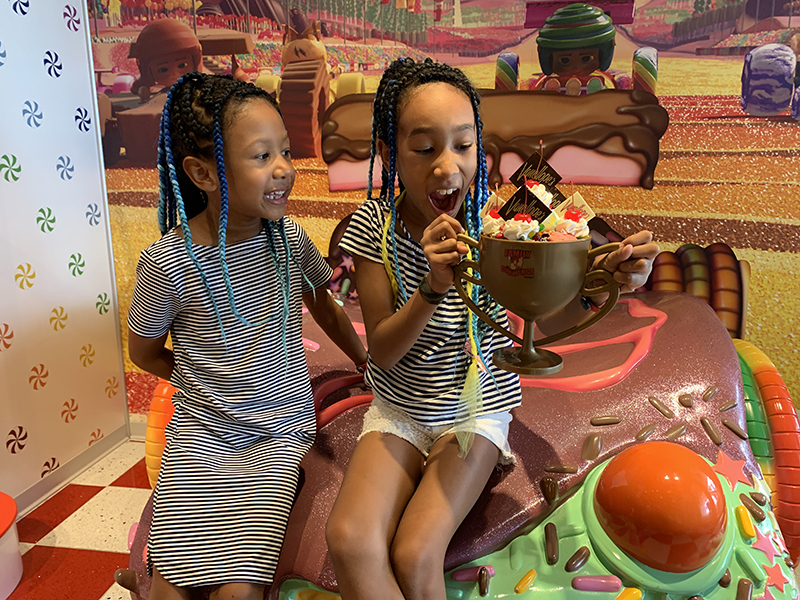 After checking out the selection, the girls decided they wanted to take on the Ralph’s Family Challenge: an ice cream sundae with eight scoops of ice cream, eight toppings, and served in a giant trophy souvenir cup! They had so much fun picking out their flavors, and then of course, attempting to finish it! Pirate Night on any Disney Cruise is a big deal. It happens on every cruise, and people get really dressed up for it! Seriously, you’ll see people in such convincing Jack Sparrow costumes that you’ll assume they work on the ship. 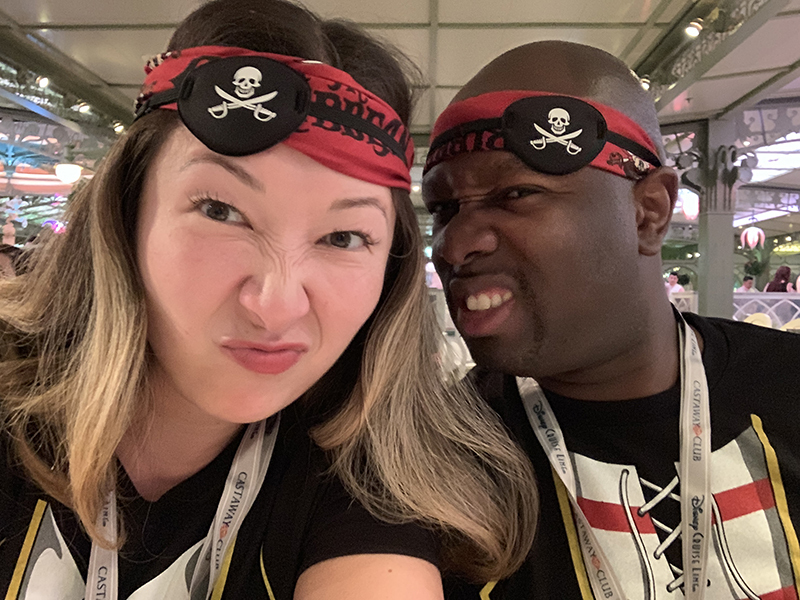 We came prepared with our pirate T-shirts and eye patches, so that’s what we wore to dinner at the Enchanted Garden. Serge and I went with seafood entrees (The seared scallops were especially good. ), while the girls ordered off the kids menu: pasta for Ella and steak for Sean. 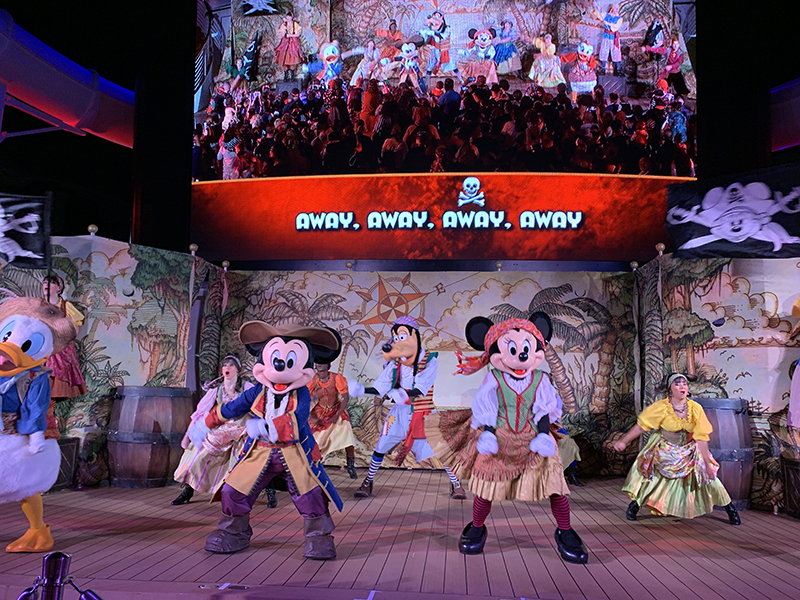 After dinner we went to the first pirate party, which was a fun sing-along performance featuring Minnie, Mickey and their friends dressed up in pirate gear. We then went to watch the live Broadway-style musical production of Beauty and the Beast, which was absolutely phenomenal. 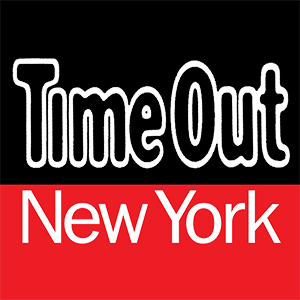 I have no doubt that this show will be hitting the real Broadway soon. 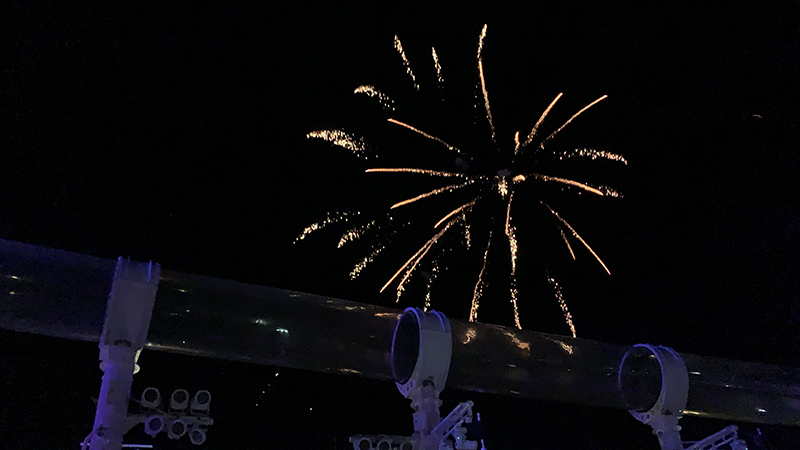 Then we headed back up to the deck for the second pirate party, which had fireworks and a DJ dance party! The next morning we had a quick breakfast at Enchanted Garden before disembarking to Castaway Cay, the private island Disney owns in the Bahamas. As we walked to the tram, which would take us around the island, there were lots of fun photo opps, including Chip and Dale in full-on tropical outfits! We took the tram to the first stop, where the main family beach is. Unlike our last cruise, this time we disembarked early in the day, around 9:30 a.m., so we had no problems finding lounge chairs on the beach. 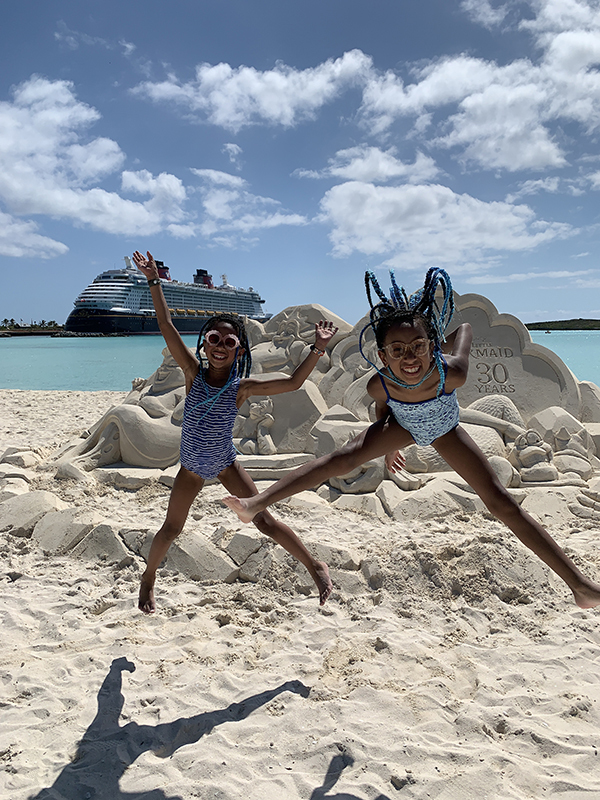 The Disney team had hooked us up with a Castaway Cay Getaway Package, which included rentals of snorkeling gear, floaties and bikes. 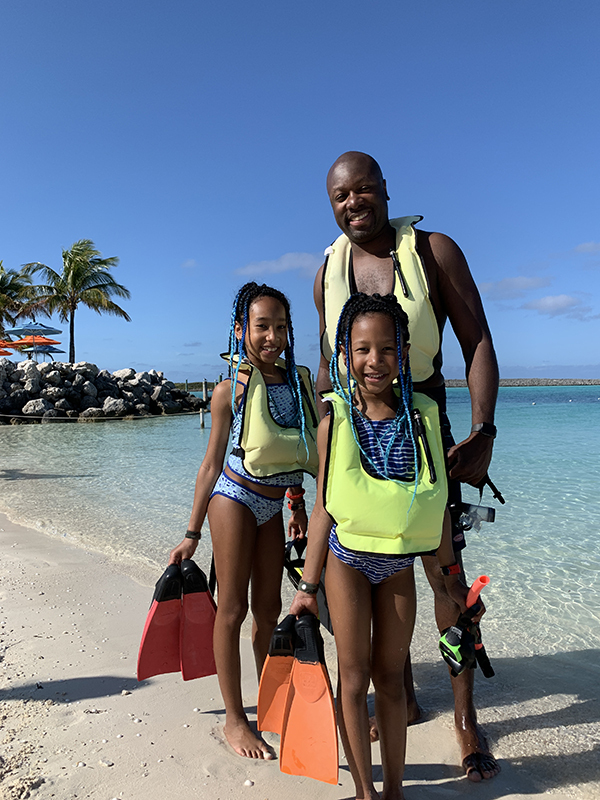 Serge and the girls did some snorkeling, while I soaked up some rays. 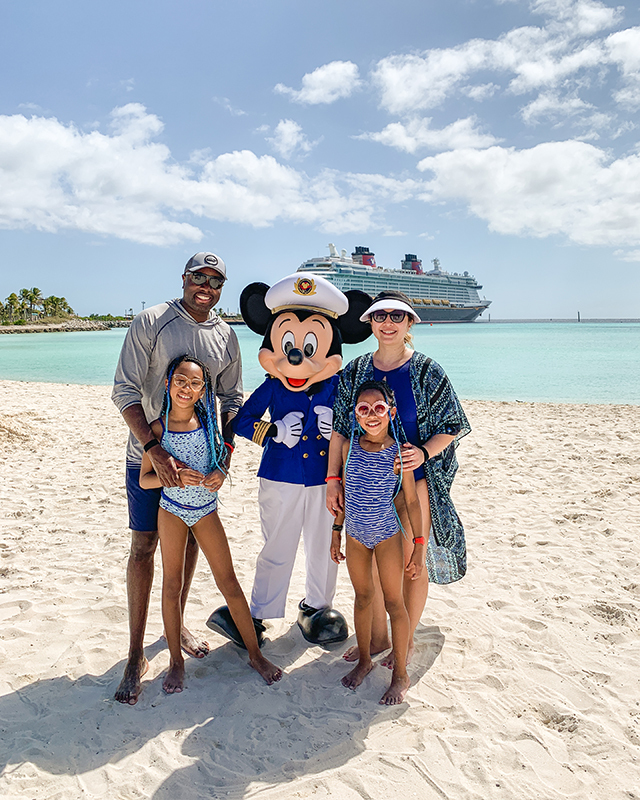 We had lunch at Cookie’s BBQ, and snapped some photos with Captain Mickey on Boat Beach, before heading back to the ship. 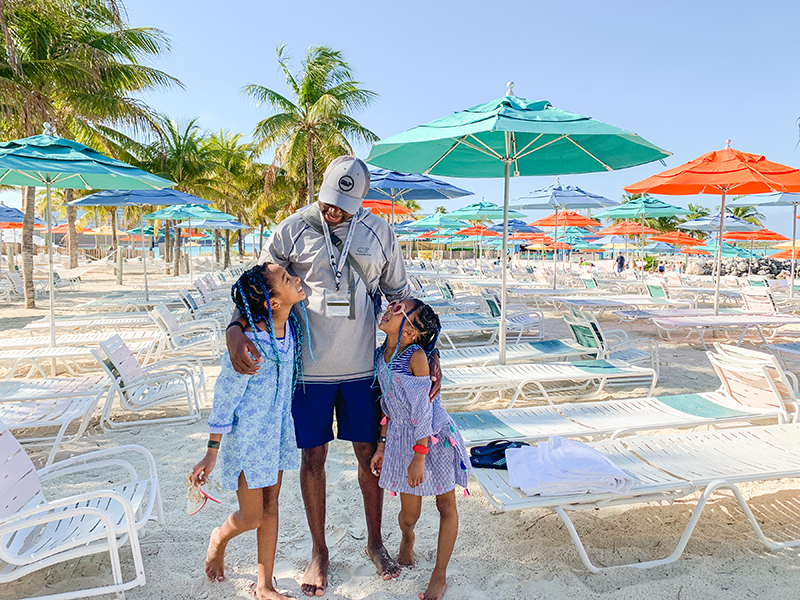 Both times we’ve been to Castaway Cay, we stayed with the girls, but if you’re interested in some alone time, you can drop the kids off at Scuttle’s Cove, the kids club on the island, and head out to Serenity Bay, the adults-only beach. 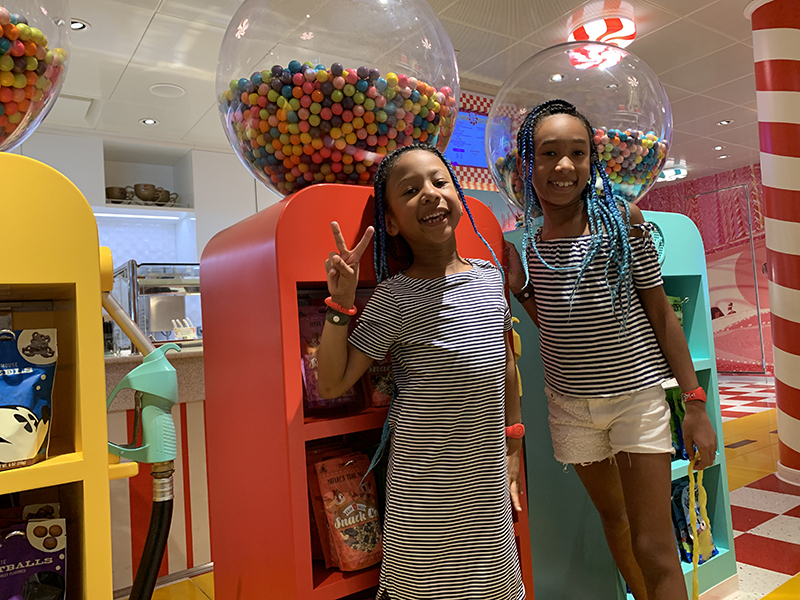 Back on the ship, we spent some time poolside, and the girls had a great time on the Aqua Duck, a water coaster where you ride a two-person inflated raft through 765 feet of snaking tubes, which include both transparent and uncovered sections. 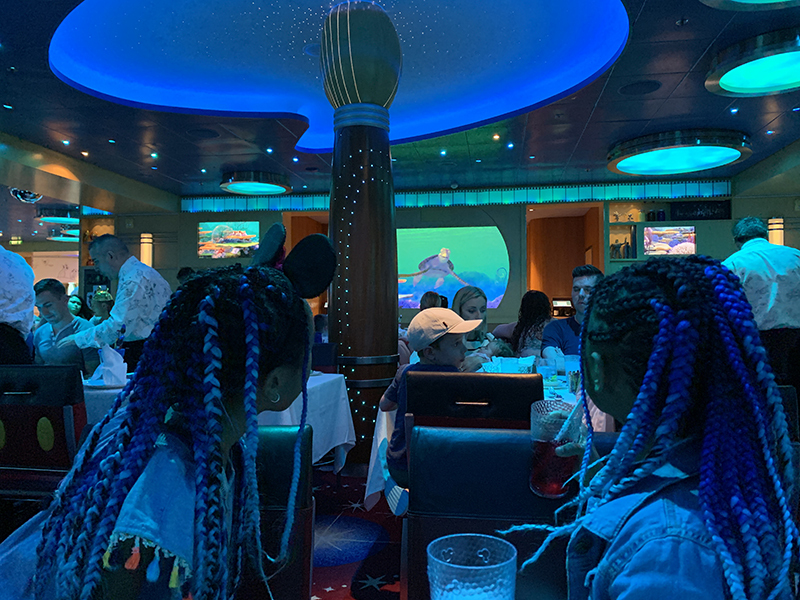 We enjoyed our final dinner on the cruise at Royal Palace, and the girls insisted on paying one last visit to the Oceaneer’s Club. On the trip, Sean and Ella had bonded with two little girls (also sisters), and the goodbyes were tearful. Their mom and I exchanged contact information so I’m sure at the very least, there will some FaceTime calls happening between the four girls! 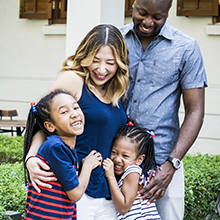 One thing we love about traveling is all the great families we meet. The girls have made so many friendships on trips that we maintain to this day, and meet up with these families again and again! 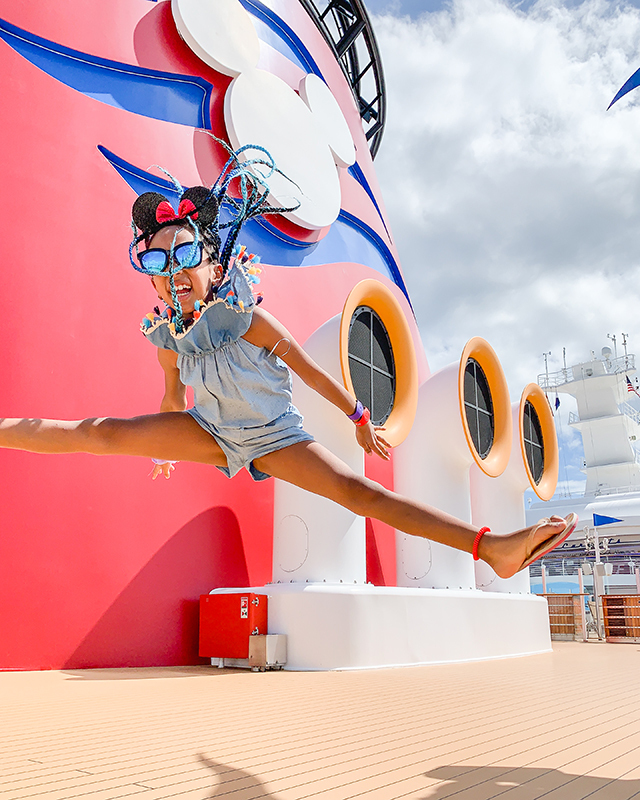 Disney Cruises are unlike any other for many reasons. The hospitality is bar none; the restaurant options provide everything from award winning cuisine to interactive family fun; Disney’s private beach, Castaway Cay, provides families with what amounts to an additional vacation all its own; the kids clubs both on the boat and on the beach are loved by children and provide adults with space to experience all the cruise has to offer on their own terms; and Pirate Night is THE family party to end all others! 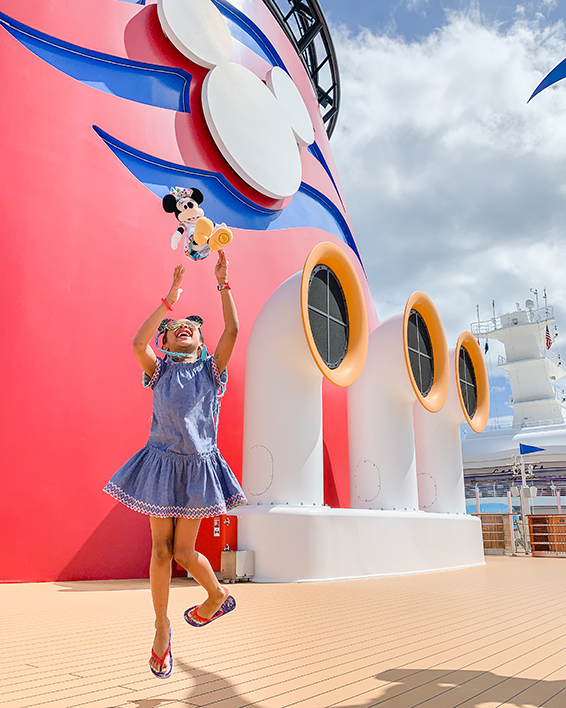 Set sail with Disney for the perfect combination of family fun and luxury. 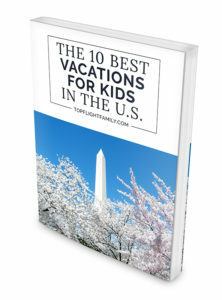 We received complimentary airfare, accommodations, meals, cruise and activities.